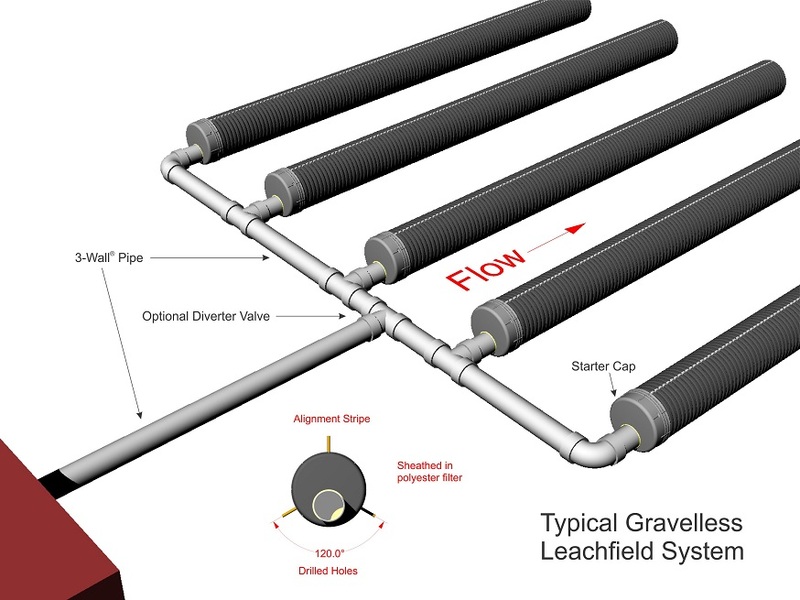 Gravel Less Leach Field Pipe – Baughman Tile Co.
Baughman Tile offers the latest in gravel-less leach field systems for the home owner as a cost effective alternative to gravel filled leach beds. 8″ or 10″ corrugated pipe comes sheathed in a tough, light weight polyester sock designed for chemical and environmental stress resistance, thereby, eliminating the need to backfill with costly gravel. A permanent white alignment stripe allows correct placement of the tile in the trench with the polyester sock in place. Baughman Tile’s gravel less system contains two rows of effluent holes in sizes of 3/8 inch for the 8″ pipe and 1/2 inch for the 10″ pipe, located 120 degrees off center from the alignment stripe. The placement and the size of the holes allows for maximum subsurface wastewater disposal. Both sizes, 8″ and 10″, come in 20 foot lengths.